Gorman and I are enjoying these cool and sunny days; just hanging out together, running errands and, as always, thanking God for every day he gives us. 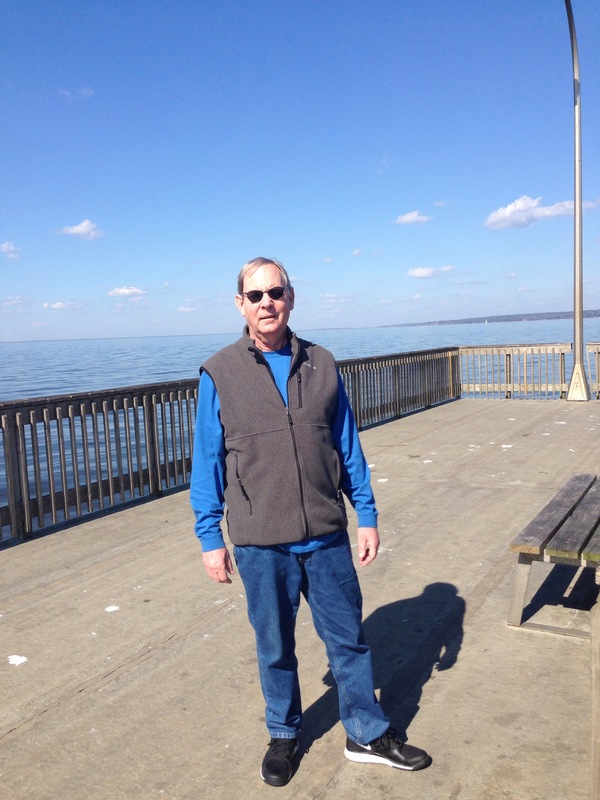 Last week we walked out on the Fairhope Pier, overlooking Mobile Bay. 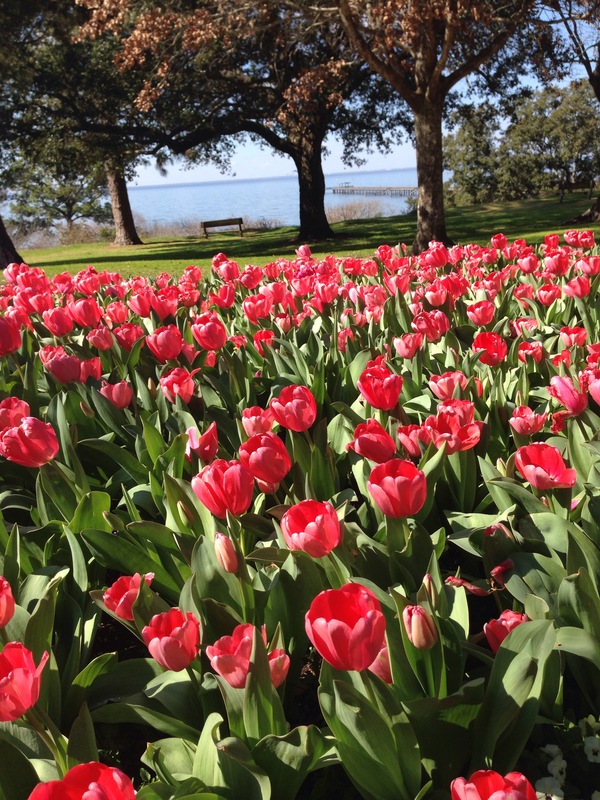 Right now Fairhope is filled with tulips and daffodils in all the beds along the streets. Next we have a trip to Santa Monica to visit our California children and then Gorman’s MRI is scheduled for Mon., Feb. 23. He had been having some headaches, which is frightening but we think they were sinus and they have subsided. We are so focused on Gorman’s brain but it occurs to me that my brain is something of a problem also. I have to work at not letting myself anticipate the worst and get bogged down in despair, dwelling on all the “what ifs”. Here’s what I read recently in Jesus Calling, my daily devotional: “Follow me one step at a time….you see huge mountains looming, and you start wondering how you’re going to scale those heights. Meanwhile, because you’re not looking where you’re going, you stumble on the easy path where I’m leading you now….But you don’t know what will happen today, much less tomorrow . Our path may take an abrupt turn, leading you away from those mountains. There may be an easier way up the mountains than is visible from this distance. If I do lead you up the cliffs, I will equip you thoroughly for the strenuous climb……walk by faith, not by sight.” Such truth and such comforting words. Then I climb out of despair until the next time. Posted on February 14, 2015, in Uncategorized. Bookmark the permalink. 10 Comments. We thank you for such a truthful encouraging message for us ALL. You can count on our prayers as y’all pray for us ALL. Where is your precious face among the tulips or next to your guy???? Your strength through out this enormous challenge has been enormous—-not only for your family, but for your supporters, as well. Some of us will need your kind of strength at some point—–and we are watching and listening. Your guy is lucky—-he knows it, and your buddies see it, as well.Thank you for sharing your journey with us. Love to both of you, Julie. you are so right beverly and gorman is a miracle which we all are grateful for. we will continue this journey with ya’ll trusting in the Lord. Ordinary truly is such a blessing! Thank you for the update. We keep you both in our prayers. Just studied Matthew Chapter 6. Reminds us of TRUST and eliminating worry. If only we would always TRUST and Be different than the World around us. This is a constant challenge for us all. We love you guys! When I was diagnosed with breast cancer in Sept 2014, a lot of “what if” started bugging me, but then I presented all my worries to our awesome God along with my cancer and today after 3 surgeries I got a cancer free report. What if are not good to have around. Beautiful devotional. 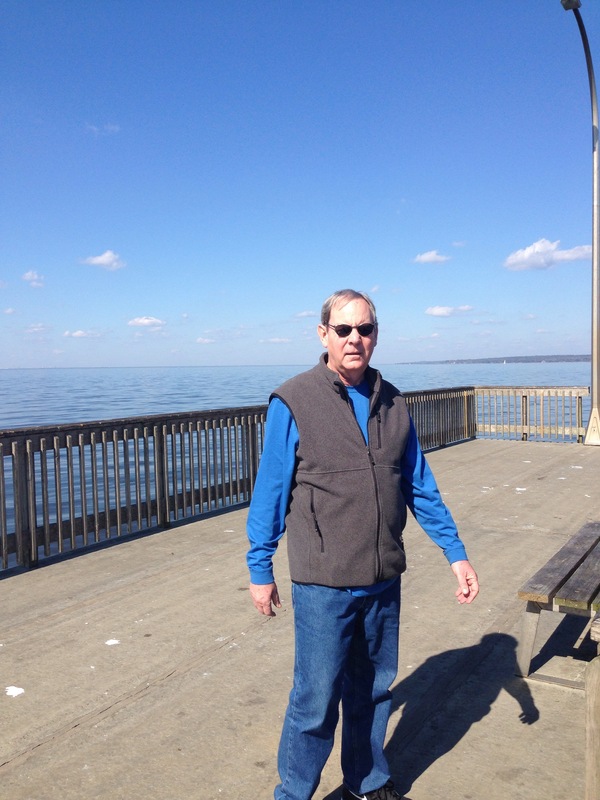 Handsome Man!…and wonderful wife for taking such care of her husband. Gorman, you are so blessed for having such a loving family! We will pray for a clear MRI! In the interim, get outside and enjoy the spring! Tulips are my favorite.